Today, we continue our study of the most important Book in the world – the Bible. It is an eyewitness account of historical events of such magnitude that they have literally shaped the world in which we live. Without this book the Western world and a good deal of the Eastern world would be completely different today than if the events of this book had never occurred. This Book is foundational to just about everything mankind will ever know or accomplish. The Bible was the first book ever put to the printing press. The man who first printed it, Johannes Gutenberg, was voted by Time Magazine, as the most important person of the last 1,000 years. Certainly, he was one of the most celebrated inventors in history. "The whole world admits unhesitatingly, and there can be no doubt about this that Gutenberg's invention is the incomparably greatest … in the history of the world." Today, we investigate an Old Testament passage that is filled with information about the Bible. We are going to take a close look at Psalm 119. This is the longest chapter in the Bible – with 176 verses. The author of this Psalm is unknown, but scholars agree that it was written by David, Ezra or Daniel. Each of these proposed authors suffered serious difficulties in his life, and the author of Psalm 119 reflects that in descriptions of plots, slanders, and taunts against him. But the most prominent theme of this Psalm is the profound truth that the Word of God is all-sufficient. This Psalm also affirms that the Word of God reflects the very nature of God Himself. There is a noticeable unique style that is used in how Psalm 119 is written. The format of Psalm 119 is an alphabetic acrostic. The Hebrew language has 22 letters, and this Psalm is written in 22 divisions, with each letter, in alphabetic succession, occurring in 8 verse increments. There are 8 verses under each letter. The first eight verses all begin with the Hebrew letter ALEPH. The next 8 verses begin with BETH, the second letter in the Hebrew alphabet. There are other Psalms that also use the acrostic method of writing - Psalm 111 and 112. 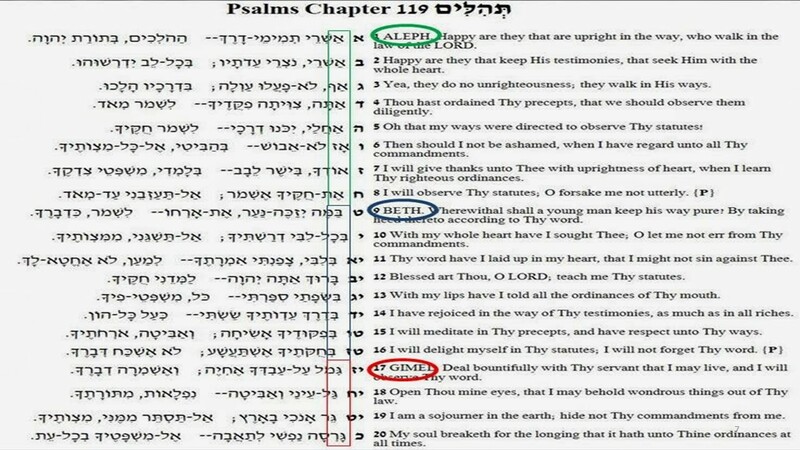 Each of these two Psalms have only 10 verses. So, how is each structured after the entire alphabet? There are 22 phrases in each of these Psalms, and each phrase begins with a successive letter of the Hebrew alphabet. In both of these two Psalms, the first 8 verses each have 2 phrases, while the last two verses have three phrases each. There are other section of the Old Testament that are written in the acrostic format. Most of the book of Lamentations is written this way. In each chapter, except for chapter 3, there are 22 verses, with each phrase beginning with the Hebrew letter applicable to that verse. In chapters 1, 2, & 4, there are 3 phrases in each verse, with each phrase beginning with the Hebrew letter applicable to that verse. In chapter 3, there are 66 verses, three times as many in the other chapters. But each verse has only one phrase, and there are 3 verses to each letter. Chapter 5 has 22 verses, but it is not in the acrostic format. The book of Proverbs contains one acrostic section. It is found in the last chapter of the book – chapter 31 – where we read about the virtuous woman. The 22 verses, beginning with verse 10 and ending with verse 31, are in the acrostic format. Each of these verses has two phrases, each beginning with the appropriate letter, except for verse 15, which has three phrases. It is not known for sure why each of these portions of the Bible are structured in an acrostic manner. Some have supposed its purpose to be two-fold. • To help the young children in learning their alphabet. • To aid in the memorization of these passages. In order to aid us to understanding what an acrostic Psalm is, I have translated the first 8 verses of Psalm 119 into English, trying to retain the meaning of the verses, yet structuring them so that each verse begins with the first letter of our alphabet. Also on them that do no wickedness, but walk in his ways. A law has thou given unto us, that we should diligently keep thy commandments. Ah! Lord, that my ways were made so direct that I might keep thy statues. And then shall I not be confounded, while I have respect unto all thy commandments. As for me, I will thank thee with an unfeigned heart, when I shall have learned thy righteous judgments. An eye will I have unto thy statutes, O forsake me not completely. Psalm 119 is probably not the favorite Psalm of very many here today. To the casual reader, it may even appear somewhat boring and redundant, having only one theme which is continually repeated. But while this may not be anyone’s favorite Psalm, I daresay that there are many verse within it that are well-known to most of you and may even be some of your favorite Bible verses. Let me share some of the well-known verses in this chapter. WHAT IS THE MAIN THEME OF Psalm 119? It is the Word of God, and its importance. Only 3 of the 176 verses is there no reference to the Word of God – verses 90, 112 & 132. The subject of the Word of God is pursued continuously and yet, each time it is mentioned it is unlike any other time. Sometimes similar phrases are used, but always in a new and fresh setting. No two verses are exactly alike. Although we do not know the author of this Psalm nor the period of Jewish history it was written, that is not really necessary, for it is so applicable to the people of God during any period of history. It is so fitted to strengthen us during trials and help us in all situations. In Psalm 119, the Word of God is mentioned by several different titles. WHAT ARE THE VARIOUS TERMS USED IN THIS PSALM TO DESCRIBE GOD’S WORD? Let me share some additional information, of a general nature, about this Psalm. 1. This Psalm consists of 21 traits of the Blessed (happy( person. 2. It contains 15 things that God has done. 3. It contains 70 requests, 30 vows, 18 secrets of victory, and 22 reasons why God is happy. “Teach me Thy Statutes.” - verses 12, 26, 64, 68, 124, 135. 5. He prays for understanding 4 times – verses 27, 34, 73, 125. 6. The relationship between life and the Law of God is mentioned five times. The approach is different in each case,……but always is personal – verses 17, 77 116, 144, 175. 7. The Psalmist expresses his love for the Law (God’s Word). Verses 47, 48, 97, 140, 159, 163, 167. 8. The word “Jehovah: is mentioned 22 times. 9. The Psalmist recognizes the quickening power of God’s Word. Verses 25, 37, 40, 50, 93, 107, 149, 154, 156, 159. I mention this aspect of this Psalm, because this is one of the earliest, possibly the very first, passage in the Bible that recognizes the quickening power of the Word of God. And in verse 88, the writer recognizes the connection between the quickening of the Word and obedience in one’s heart to it. 10. 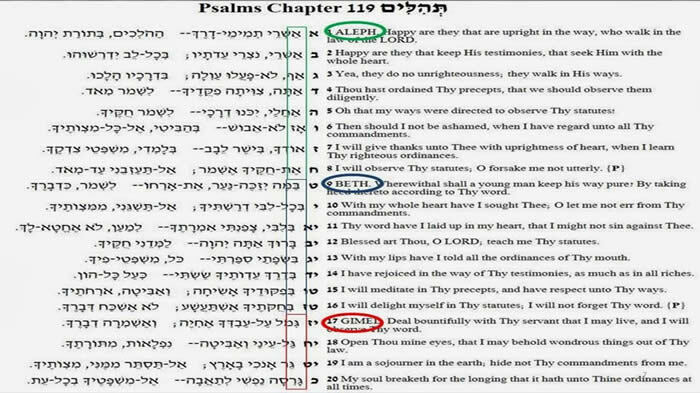 In Psalm 119, there are 198 references to the Word of God and there are 610 pronouns. This aspect gives emphasis on the personal nature of God’s Word. It not only sets forth the excellency of the Word of God, but also the happy effects of obeying it and applying it to every part of our living. What instruction can we get from this Psalm about the Word of God? There is so much in this chapter, I will only be able to scratch the surface by giving a few examples. I have a 7-volume set by Charles H. Spurgeon, called The Treasury of David. In it Spurgeon give 398 pages to this one Psalm. I am giving you only four examples from this chapter. I want to show the importance of the Word of God. I also want to address why it matters that you and I read the Bible or not. All God’s commandments – His Word – is truth. 17 Sanctify them (that is, set them apart) by Your truth. Your word is truth. In other words, not the smallest letter, nor the least stroke of the pen, will pass away from the Word of God. In a world that tends to view everything as being relative, the Word of God stands unchangeable. Every detail of God’s Word can be counted on. There is no guesswork about it. God’s Word has been underwritten by His very name, and it is authoritative in every department of the believer’s life. “Forever!” God’s Word is eternal. “Your word is settle in heaven.” That is a tremendous description of God’s Word. It speaks of confidence and security. In essence, God is saying, “You can count on it.” Our world desperately needs something it can know for sure, that it can count on. The Bible is the cornerstone upon which our faith must rest. We dare not ignore it – And we dare not be ignorant of it. So, the first reason the Bible is so important is, it is an absolute in a world that thinks there is none. In a world full of lawlessness and corruption, in a day of crumbling morals and shifting foundations, we need guidelines for living. How does a Christian live in such an age as this when everything seems to be falling apart. How can I get along when society seems to grow more corrupt and more sinful with each passing day? Whether we are playing a game, driving a car, or baking a cake, there are certain rules that must be followed for our safety as well as our success. The Bible teaches that the Christian life is one of constant growth. When you were born again, you were born into God’s family It is God’s purpose that you will grow into full stature and become mature in Christ. It would be against the law of God and nature if you were to remain a baby and thus become a spiritual dwarf. In 2 Peter 3:18, (NKJV) the Bible says that we are to grow. God has given us His Word to help us grow. According to Psalm 119, the Spirit of God through the Word of God will guide you and I through the quicksand, storms, sorrows and afflictions of life. Not only does the Word have power to guide you from darkness into light, it can also show you where and how to walk in your everyday life. The Word of God tells us the purpose for our creation and being. When we have issues, God’s Word helps us troubleshoot and make correction in our life. The Psalmist recognized the need for a manual for living. He repeats the thought in verse 9 of Psalm 119. He starts the verse with: How can a young man cleanse his way? and follows it with the answer: By taking heed according to Your word. Verse 16 tells us that he (the psalmist) delights in the Statutes of God. To study them is like finding treasure (vs. 14). They affect him like music, they are his “song” (vs. 54). They taste like honey (vs. 103). They are better than silver and gold (vs. 72). As his eyes are opened more and more and he sees the great depths in the Word, it excites wonder in him (vs. 18). All of these speak of a person who has found the Word of God to be a perfect handbook for living, and he is enjoying the fruits of obedience to it. He becomes a man that desires to reproduce the Law of God in his daily living. This effort does not spring from a fear of God and what might happen to him if he does not heed God’s law. Rather, it springs from a love for the Giver of the Law. As the owner’s handbook for life, the Word of God speaks about – spiritual life, eternal life, indwelling life, satisfying life, and resurrection life. And so much more. This is a major theme of this Psalm. Have you had false things said about you. 51 The proud have me in great derision, Yet I do not turn aside from Your law. The Psalmist was living in a difficult and hostile environment. People were speaking out against him. The Bible is clear that godly people are not exempt from trials. In fact, it is a promise you can count on. In all of our trials, God has given us stability and comfort. He certainly had for the writer of this psalm. In all his trials, the psalmist states that God’s Word gave him stability and comfort. The world can produce a level of tranquility from time to time, but it is not the same as the peace of God. God has a peace that is beyond our human understanding. The peace that comes from God will calm your hearts and minds. The settings of this Psalm were much like we have today. It was a timer of rampant religious skepticism. Verse 126 singles out that religious skepticism. It was a time of sickening apathy and indifference. The people changed quickly. Their attention span was short. They jumped from one fad to the next. Verse 113 speaks of having a double mind. The society was thoroughly profane as we read in verse 95. But the writer of this Psalm is thoroughly immersed in the Word of God. We should be likewise.